← How to set the paper size by PDFPrint Command Line application? Reading news has became our habit. Even if we do not go out of office we can get news flooded into your cellphone or computer. But not all the news we do really like or need, so how to get the useful and interesting news in an high efficient way is what we really care about. Based on those need, VeryPDF developed a new cloud based application named Free Online RSS Feed to Email Subscription,by which you can order RSS news to your email box for daily reading. When the RSS news sent to your email box, you do no need to install RSS reader then you can read RSS news easily. Normally speaking, the RSS news is saved in the formats of XML file format, when reading those news, you need to install RSS reader. By this free online application, downloading RSS reader can be ignored. Under the help of it, you can read RSS news at mobile phone through email box. Meanwhile you can copy news to local files then you can read RSS news offline. Please check more information of this software on homepage, in the following part, I will show you how to use this software. The following snapshot is from the website, please have a check. All you need to do is just two steps. 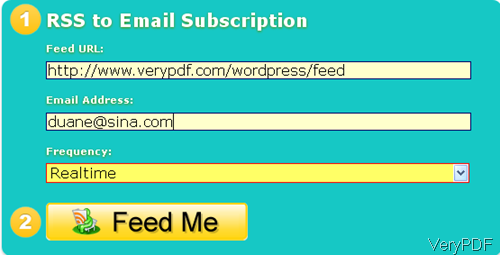 Please input the Feed URL and then the email box you need to receive the RSS News. The click button Feed me, you can finish ordering RSS news. When you order RSS news, you can choose how long update the news in your email box. This software is really totally free, so you do not need to worry there will be fee charged without your permission. After clicking button Feed Me, later there will be an conformation email sent to your email box. Please confirm it then the new your order will be sent to your email box at once. Simply open you email box in your mobile phone then you can enjoy the news you really like. Say if you are football fun, simply order RSS news of football then you can checking daily news of football. This software supports email address of the whole world and all the languages, so you do not need to worry there will be message code when you open news on mobile phone. This free online application will be a good assistant to kill your spare time and catch up daily news. During the using, if you have any question, please contact us as soon as possible. This entry was posted in VeryPDF Cloud API and tagged RSS news. Bookmark the permalink.